CRP wins the T20 Physically Challenged Cricket meet in India. 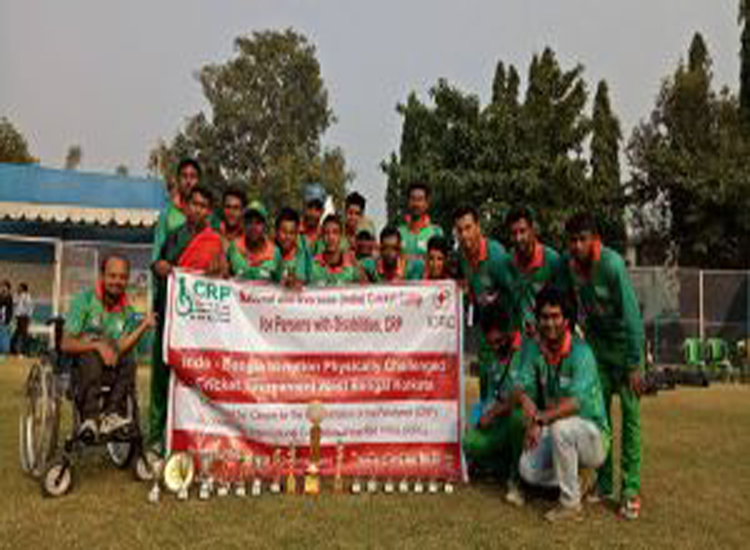 CRP physically challenged cricket team won the coveted title by 2-1 in a three match Indo-Bangla series in the T20 Physically Challenged Cricket meet in Kolkata. In the first match India won by 08 wickets but Bangladesh fought back to beat the host by 58 runs in the second encounter. In the final series deciding match, Bangladesh won the toss and scored 119 for 6 wickets at FC Ground Kolkata on Sunday 18th December, 2016 while India lost all wickets in 19.2 overs for only 102 runs. A sparkling batting from Shariful Islam and a brilliant show from the bowlers especially Akbar Hossain have powered Bangladesh to a huge series win. The award ceremony was attended by the MLA of West Bengal, Mr. Arjuna Pal; Joint Secretary of India Cricket Association, Mr. Samaresh Majumdar; President of Physically Challenged Cricket Association of India Mr. Surendara Lahiya and President of West Bengal Cricket Association, Mr. Dilip Chatterjee. CRP physically challenged cricket team under the support of the International Committee of the Red Cross (ICRC) participated in the tournament. Brac Bank donated Tk. 10 lac to CRP.